Home care workers and their clients, other caregivers and union leaders rallied on the steps of the State Capitol Tuesday to protest proposed cuts to the program that funds services that keep more than 400,000 seniors and disabled Californians in their own homes. SACRAMENTO—Dozens of homecare workers, Kaiser workers and other caregivers protested at the governor’s offices in Fresno and Sacramento today to protect services for seniors and people with disabilities. 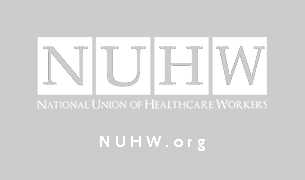 They’re part of the National Union of Healthcare Workers (NUHW), an independent union formed less than two weeks ago by the elected leaders of United Healthcare Workers-West (UHW) after they were undemocratically ousted by SEIU.